[Update]: This blog post was updated on March 18, 2019. Some organizations may require to automatically forward emails or send a copy of a message to other mailbox on Exchange. The reasons may be different ranging from auditing purposes, data leak protection (DLP), availability, etc. In other words, there are cases when emails from certain users should automatically reach other recipients too. Luckily Exchange Server provides transport rules, which you can use to process messages according to your needs. These include possibility to forward, bbc or cc messages to different recipients automatically. First, open Exchange admin center (ECP) and go to the mail flow section in the left pane. Next, go to the rules tab and click the “+” icon. This opens a list of rules. Click Create a new rule. In the new rule window, configure your rule settings. Name the rule, then go to the Apply this rule if… section and click The sender is…. Choose the sender that you want to set up the rule for. Highlight it on the list and click the add-> button. Then click OK.
Next, back in the new rule window, click More options… at the bottom. This unlocks more actions in the Do the following… menu. Forward message for approval… This option allows you to stop the message from leaving your organization until it is accepted by an authorized person. Redirect the message to… The message is not delivered to the original recipient and is redirected to the one defined in the rule. 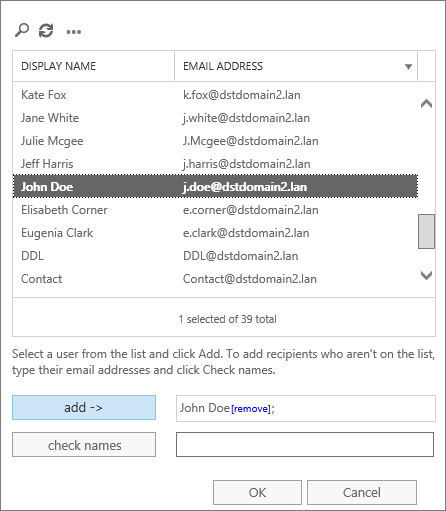 Add recipients… As the name suggests this action allows you to add more recipients to the message in the To, Bcc, or Cc field. Note: Each of these actions has its own limitations – Forward message for approval requires manual interaction, therefore, it is not entirely automatic. The Redirect the message to… action completely omits the original recipient’s mailbox, which is not desired in our example scenario. The Add recipients… is the closest one to our requirement, however it is not “silent” – the recipient might see that he or she was not the only one getting this message as some email clients might show the “undisclosed recipients” phrase in the address field. Let’s pick the Add recipients… action and click to the Bcc box. This automatically bbc emails to a different mailbox. In the following window, select recipients who should receive a copy of the message. Confirm your selection with the OK button. Then, click Save to finish the rule configuration. 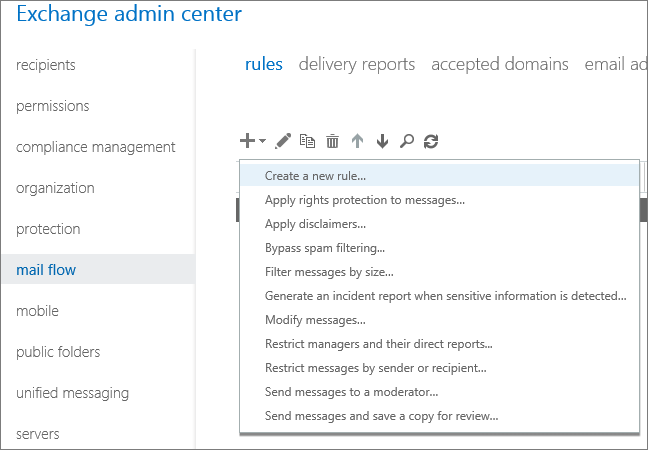 That’s it – your rule is now ready to add other recipients in the Bcc filed to every message the user sends. The main drawback of using addresses which are hidden within the Bcc field is that the original recipient might see it in their email client (as the “undisclosed recipients” phrase). What’s more, if the Bcc recipient replies to that email using the Reply to all option, it will simply make aware the original recipient that there are more people in the conversation without knowing it originally. That might be perceived at best dishonest. Lastly, the Bcc option is often used by spammers, so your message might land in the Junk mail or even worse – be completely blocked and your domain might be blacklisted by the spam-filtering facilities. A complete solution would be to perform mail redirection directly on the server level, without modifying the original message at all. 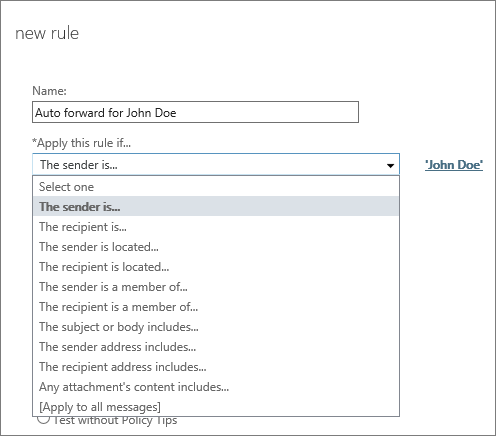 CodeTwo Exchange Rules Pro allows you to set up automatic email forwarding with the use of a wide range of conditions that can trigger the rule. The program also keeps you safe as it does not tamper with the original email header at all. 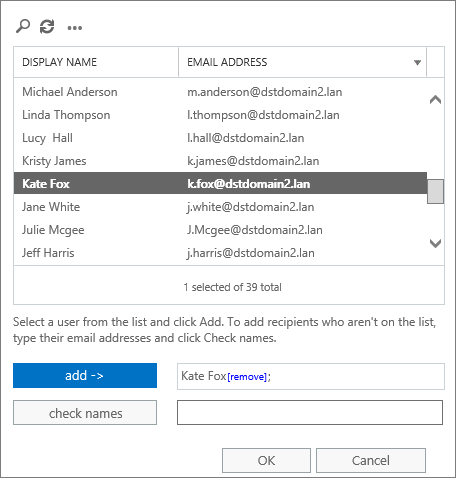 How to set up server-side email signatures on Exchange Server 2019? unless you add the original recipient to the redirected to list. That is right; however, since you cannot use any kind of “original recipient” placeholder in mail flow rules, you might find it a little difficult to implement. Thanks for the update how to get the report for whole org who were having an external email address forwarding on it. I’m so grateful for this article. I just just spent 6 hours bashing my head again a wall trying to figure out external forwarding. This was the only thing that worked.